Said to have been given by Empress Catherine II of Russia [1729-1796] to Prince Aleksandr Andreyevich Bezborodko [1747-1799], her secretary of petitions and later imperial chancellor; given by him to Prince Viktor Pavlovich Kochubei [1768-1834], Russian diplomat and statesman. (Count Alessandro Contini-Bonacossi, Rome); purchased July 1932 by the Samuel H. Kress Foundation, New York; gift 1939 to NGA. In notations in the Samuel H. Kress Foundation records, NGA curatorial files. These come from the bill of sale (see note 2), which reads "Two Portraits of Young Girls...By Count Pietro Rotari...From the Royal Palace of Catherine of Russia...Were given as a present to Prince Besborodko, Chancellor of State, from whom they went to The Collection of Prince Kociubey, Hetman of Ucraine." The date of purchase is often given as 1939, which is, however, the date the painting entered the National Gallery. The bill of sale for several paintings, a book of drawings, a sculpture, two vases, and a velvet cope is dated 29 July 1932 (copy in NGA curatorial records). Roberto Longhi's expert opinion on the back of a Kress photograph (NGA curatorial files) is dated November 1932, and Alfred M. Frankfurter. "Eighteenth Century Venice in a New York Collection," The Fine Arts 19 (December 1932): 10, repro. 7, documents the painting in the Kress Collection by December of that year. The support is a medium-weight, plain-weave fabric with irregular threads throughout and is identical in thickness and weave to that of the pendant. A thick white ground was applied unevenly with a broad brush and toned with a reddish brown imprimatura. The paint was applied evenly in layers of medium thickness and brushed wet-into-wet. The background was laid in before the figure was painted, although the contours of the face and other passages were reworked as the design approached completion. 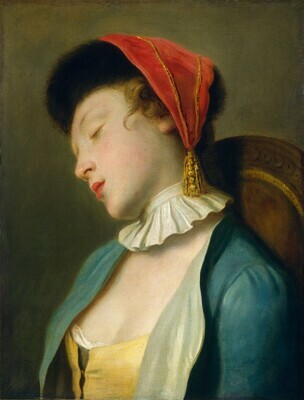 The shadow at the corner of the sitter's mouth has been adjusted and may originally have been larger; the prominent curl of hair may originally have been a completely circular lock. The painting has been restretched onto a stretcher slightly larger than the painted surface. There are small losses and abrasion throughout. The varnish is very slightly discolored. The painting was relined about 1933 by Stephen Pichetto, who also removed discolored varnish and restored the picture. Frankfurter, Alfred M. "Eighteenth Century Venice in a New York Collection." The Fine Arts 19 (December 1932): 10, repro. 7. Preliminary Catalogue of Paintings and Sculpture. National Gallery of Art, Washington, 1941: 174, no. 218. Book of Illustrations. National Gallery of Art, Washington, 1942: 243, repro. 181. Paintings and Sculpture from the Samuel H. Kress Collection. National Gallery of Art, Washington, 1959: 241, repro. European Paintings and Sculpture, Illustrations. National Gallery of Art, Washington, 1968: 104, repro. Nikolenko, Lada. "Pietro Rotari in Russia and America." The Connoisseur 171 (July 1969): 195, fig. 2. Fredericksen, Burton B., and Federico Zeri. Census of Pre-Nineteenth Century Italian Paintings in North American Public Collections. Cambridge, Mass., 1972: 179. Shapley, Fern Rusk. Paintings from the Samuel H. Kress Collection: Italian Schools, XVI-XVIII Century. London, 1973: 157, fig. 298. European Paintings: An Illustrated Summary Catalogue. National Gallery of Art, Washington, 1975: 310, repro. Shapley, Fern Rusk. Catalogue of the Italian Paintings. 2 vols. Washington, 1979: I:412, II:pl. 291. European Paintings: An Illustrated Catalogue. National Gallery of Art, Washington, 1985: 356, repro. De Grazia, Diane, and Eric Garberson, with Edgar Peters Bowron, Peter M. Lukehart, and Mitchell Merling. Italian Paintings of the Seventeenth and Eighteenth Centuries. The Collections of the National Gallery of Art Systematic Catalogue. Washington, D.C., 1996: 244-248, color repro. 246.